Happy Cinco de Mayo week!!! It’s the MOST WON-DER-FUL TIIIIIME…….OF THE YEEAAARRRR!!!!! I love frying things. People complain that their house smells after frying things, it’s such a hassle, they burn down the house…..all legitimate concerns, I suppose, I just have yet to experience any of the above. These fried avocado tacos got me on the fried avocado train. I also fry veggies, make falafel, peaches, fry all of the things! I just can’t do most pre-packaged, pre-mixed things. Like taco packets. I just can’t. So I do my own, and it’s got a wonderful smokey, rich flavor. Big fans in our house. Do turkey, beef, lentils, whatever. Brown up your choice in a skillet and add your own seasoning. And this dressing! You’ve probably had a creamy tomatillo cilantro dressing, and this is as good as it gets. Nice and simple. Throw everything into the blendtec and blend. I like to use the twister jar for thick dressings. Use whatever greens you’d like! I usually like to mix a spring variety mix with some romaine. Different textures do great to support a salad with all sorts of toppings. These come out piping hot and then you sprinkle a little kosher salt on them. Oh they’re good. OK I made my own tortilla strips too, but you can make life easy and just crush up some tortilla chips in your hand and blow them into your salad. All Nacho Libre-like. Celebrate Cindo de Mayo all week, guys! Mucho delicioso amigos! 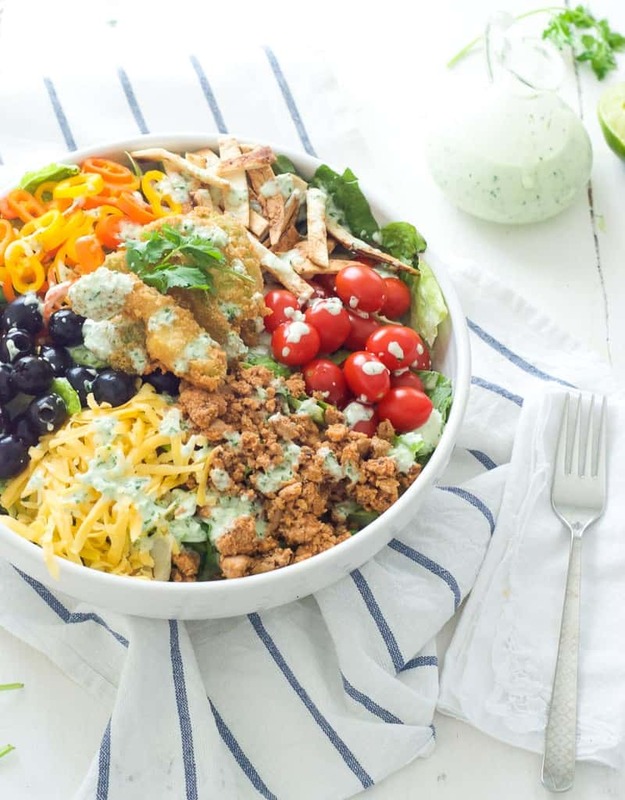 A salad so good, it's loco. Make the tomatillo cilantro dressing by blending everything in a blender. Refrigerate at least 1 hour before serving. Fill large pot with enough oil so that you have 1 1/2-2 inches and heat over medium heat. Prepare three bowls for frying avocados: in the first, place 1 c flour. In the second, whisk the eggs and milk. In the third, mix panko, flour, salt, onion powder, garlic powder, and baking powder. Begin taco meat by cooking turkey in large frying pan. Add spices and water. Simmer on low until ready to plate salads, stirring occasionally. Once oil has reached 375 degrees, or a drop of water immediately begins to sizzle when flicked in, begin to fry avocado. Dredge each avocado slice first in flour, then in egg/milk mixture, and last coat in the seasoned panko crumb mixture. Drop in hot oil, and it should immediately begin to sizzle. If it doesn't, continue to let oil heat. Fry about 4 wedges at a time, being careful to not crowd the pan and drop the oil temperature too much. Flip halfway through. Remove and let rest on baking sheet or plate, immediately sprinkle with salt while avocado is still hot before frying the next batch. 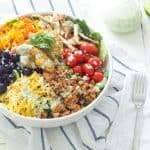 Plate salads with lettuce, taco meat, peppers, tomatoes, olives, cheese, tortilla strips, fried avocado, and dress with dressing.